We’d love your help. 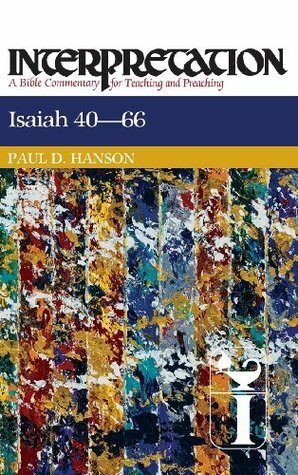 Let us know what’s wrong with this preview of Isaiah 40-66 by Paul D. Hanson. The latter half of the sixth century BCE found the Jewish community fragmented and under great strife after having been conquered by the Babylonian armies. As a response to a growing despair over life in servitude and exile, Isaiah 40-66 was written. Paul Hanson examines the writings of Second and Third Isaiah. What he discovers is a poetic argument for a loving and attent The latter half of the sixth century BCE found the Jewish community fragmented and under great strife after having been conquered by the Babylonian armies. As a response to a growing despair over life in servitude and exile, Isaiah 40-66 was written. Paul Hanson examines the writings of Second and Third Isaiah. What he discovers is a poetic argument for a loving and attentive God and the rightful place of God's creatures in the unfolding of history. To ask other readers questions about Isaiah 40-66, please sign up.